Most people have no clue what is going on in the liturgy, in the prayers, postures, clothing, and colors, in the importance of ordination and the distinction between lay and clergy. I think for this to be a great boon for the Church, the bishops, priests, and deacons, as well as any pastoral staff, need to constantly be engaged in good, enthusiastic, and thorough liturgical catechesis. Since Vatican II there has been a reverse-clericalism that is, I think, disastrous for the Catholic Church. Clericalism was that post-Trent mentality that basically reduced the laity to spectators, leaving the theology and Christian spirituality to the clergy and/or the religious. Vatican II simply clearly and emphatically explained the role of the laity in the Church (see Lumen Gentium), and subsequent popes, like Blessed Pope John Paul II, furthered that understanding. But like all good things, the teaching emphasis on the laity was overextended and twisted. It became this reverse-clericalism, whereby the laity thought, "Hey, I can be a liturgical minister too!" and they crowded around the altars and, to varying degrees, crowded out the clergy. This was completely antithetical to Vatican II. Lay persons are meant to sanctify the temporal order, bringing Christ into the work-a-day world. But instead we became quasi-deacons or wannabe priests. This followed a whole host of bad 70's theology that muddled and confused the universal priesthood of the faithful with the ordained priesthood. Clergy and laity seems a weak distinction with little merit left to its upkeep. Now people are offended when the dignity of Holy Orders is affirmed. "But what about me? What about my priesthood? Am I less Christian than Father So-and-So?!" A lack of liturgical catechesis is evident in the attitudes, dress, and piety of us lay men and lay women who come to Mass. There is a lack of silence, of reverence, of carving out ten minutes or so of time for personal spiritual preparation to receive the Word of God. We just have no clue what is going on and what is about to happen. 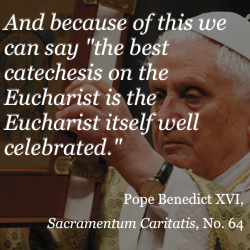 Liturgical catechesis is one of the most important things a parish can do because the Mass is the central experience (the source and summit) of what it means to be Catholic. I think its proper place is in the homily, but obviously instruction needs reinforcement in the classroom and at home. 1. The Three S's. Spiritual advancement cannot occur without cultivating the soil of the three S's: silence, stillness, and solitude. Personal and environmental silence is crucial to fighting distractions and focusing the intellect on reception, reflection, and meditation. 2. There is proper dress. Now I am not a clothing Nazi and rarely do I roll my self-righteous eyes at the pattern on someone's shirt, but what has happened to wearing your "Sunday best"? Modesty is typically a huge problem, especially in the Summer months, but I am not even talking about that. I mean this: the liturgy is kind of a big deal around here and we should treat it accordingly. 3. Traditional and ancient spirituality. The more a person is in touch with the history, development, and significance of the liturgy, the more the Church's Sacred Tradition becomes alive. Liturgical catechesis ought to kindle the desire for beauty, and for contact with the ancient ways of celebration. 4. Less clapping. There, I said it! Clapping means, "Job well done. I was entertained by you. Thanks!" The choir's music and/or the homily are not meant to be entertainment. This is the single greatest poverty of the last fifty years in liturgy. The sacred is not about fun. It is about joy; deep, meaningful, lasting joy. I am not a sour-faced grump who hates to laugh or smile, but when a choir gets a rousing round of applause, maybe we should be asking Who was the central focus of the liturgy today? 5. Early arrivals and late leavers. We are all busy. I have a baby and am plenty fussy myself on Sundays, but it is always a great spiritual benefit to carve out time before Mass to prepare the 3 S's while in His presence, and to stay a few minutes later and say, "Thank you" for the honor to participate in the Eucharistic liturgy. 6. Scriptural Readings heard and prayed ahead of time. We have all week to grab the First Reading, Second Reading, and Gospel from the USCCB.org website and pray through them in order to be as receptive as possible to hearing God's Word. Why are we not doing this more often? Why am I not doing this right now? I think we have a great blessing upon us with the new, and corrected, translation of the Roman Missal in English. It is an opportunity for catechesis that has not occurred in half a century, and we sons and daughters of the Church ought not to allow this to pass us by. If we do, quickly the opportunity will turn into a crisis, as a dry and weary congregation will be frustrated with a Church they do not understand.